They took inspiration from the rich heritage around them. As Beamish Open Air Museum is on their doorstep they focused on the Colliery Village, rebuilt and set in 1913. They loosely broadened the era to include the late Victorian and Edwardian periods. The fabric range they have used complements the era, producing a vintage feel with a contemporary twist. Over twenty projects are interwoven with Florrie's memories, Betty's rhymes and recipes, and some really beautiful imagery. A folksy light-hearted collection of household objects found in the North East in the past. There are bags, cushions, dolls, rag mats and recipes. There is a scrappy quilt, a runner and 'Mother's Posh Bag' to interest quilters. Many of the items have templates. The book is illustrated with colourful photos and ends with an explanation of the dialect words. In the North East of England where this reviewer used to live is a famous open-air museum called Beamish. Part of this replica of what this area looked like in times past is a colliery village set forever in 1913, and it is from this that the authors take their inspiration for this book of needlecraft projects. Two ladies called Florrie and Betty have written this book, and they appear throughout the book together with their snapshot memories of what life was like back then and a few recipes. They appear as rag dolls, and they are photographed along with the projects (over twenty of these) in settings at the museum. There are instructions on how to make items for all parts of the home, including a peg bag, rag dolls, handbag, cushions, draught excluder, table runner, quilt and many more. Each project contains patterns for the item (at the reverse of the book), instructions (in rather small type) as well as the author's charming dialect memories of life in a colliery village in those days - think Catherine Cookson. This is a good place to learn crazy patchwork, make a basic rag doll, peg doll, hooky or proggy mat (a local craft) and various other simple but enjoyable crafts that involve recycling scraps of cloth. In short, a very green craft book as well as being a very attractive book to look at, with its evocative photographs, brief but vivid descriptions of the north east of England over 100 years ago and the imaginative projects. This is a delightful nostalgic project book written in the Northern idiom by two friends Florrie and Betty and inspired by a colliery village at the Beamish Open Air Museum. This attractively illustrated soft back volume contains seventeen projects including bags, quilts, cushions and dolls, for which full-size templates are provided. Comprehensive instructions are given for each item, using straightforward patchwork and stitching techniques. This would make a lovely Christmas gift for any keen needlewoman. 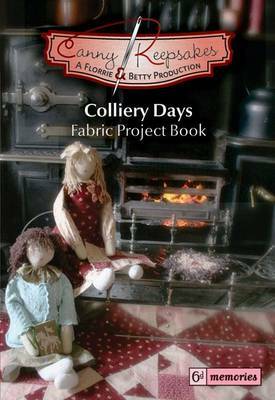 This is a delightful nostalgic project book written in the Northern idiom by two friends, Florrie and Betty and inspired by a colliery village at the Beamish Open Air Museum. This attractively illustrated soft-cover volume contains seventeen projects including bags, quilts, cushions and dolls, for which full-size templates are provided. Comprehensive instructions are given for each item, using straightforward patchwork and stitching techniques. This would make a lovely Christmas gift for any keen needlewoman. Take a trip down memory lane with Florrie and Betty, who hail from the north east of England. They have created some delightful nostalgic projects combining fabrics with a vintage feel and designs with a contemporary twist. Inspired by a colliery village, they have created seventeen projects for the Scullery & Kitchen, the Bedroom & Parlour, Ma's Special Things and The School & Little 'uns, as well as including little snippets of memories, recipes and scenes from yester years. I loved the grading system that goes from 'nice and relaxing' to 'put the coffee on, white no sugar'! There are some lovely designs in the book which would make ideal gifts, such as the fabric corsages, and the colliery peg bag. Templates are provided and there is a handy section with hints and tips, materials needed and terminology. I have a feeling that this is just the beginning of ventures we will be seeing from Florrie and Betty. Despite coming from Lancashire I can really empathise with this book because it is a book of memories from a long past time. My Granddad was a miner and I have, to this day, his miner's lamp, my grandmother's clogs and the last piece of coal from Brackley pit before the pit wheel stopped turning forever. I also have a wealth of stories about how hard the daily life was and what it was like to be a miner all those years ago, and this book, despite being from a different part of the North, is so true to life that one feels you are stepping back in time and sharing the life of Florrie and Betty. This is much more than a quilting book with its amalgamation of recipes and anecdotes of daily life; it is a `through the looking glass' taste of life which was hard but so much simpler than the frenetic life-styles we lead today. Sit back and enjoy a good read as well as over 20 fresh, exciting and useful projects including quilts, dolls, bags, cushions and more. The book is beautifully photographed on location and the full-size templates make the projects easy and convenient. I am sure this would make a unique Christmas present for any British quilter. Colliery Days is a Canny Keepsakes production containing stitched projects inspired by the history of the North of England. There are more than twenty of these projects, split into chapters depending on where they would be used in the home; they range from tea cosies to bedspreads so there's plenty for everyone. The projects in the book have been made up in traditional fabric which gives them a really vintage country feel. The page layouts have a similar feel; the instructions are interspersed with snippets and historical anecdotes and recipes. The book has a whole lot of character which is very charming, browsing through it is a pleasure. Anna and I had a go at making the flower corsages. These were good fun and are very straightforward. We chose different colour scheme which gave different looks to the finished items. When it came to following the instructions I found the page layouts a little distracting, the photographs of the finished items are very large which is helpful, but I can't help wondering if this is at the cost of larger print in the instructions. All in all the book has a nice feel, very homely. I would say it would be most suitable for a traditional stitcher, there's nothing very cutting edge here but lots to build skills and confidence, whilst also being nice to mooch over with a cup of coffee.